Resolved What Aspect of the BPM Industry is Most Ripe for Disruption? Looking ahead toward December and the year ahead, what aspects of the BPM industry do you think are most ripe for disruption? Doing things the ways the vendors and large systems integrators have always been doing them for over a decade now. Every area of BPM software will be disrupted by the freemium pricing model - "deliver a ton of value first, collect payment later". To make the business model work, early customers need to be able to get going with little or no support. - elegant intuitive software. No, I mean REALLY intuitive... could your Mum be successful with it, with no handholding? - the app, sales and marketing metrics to track customer behavior to be able to course correct and tweak. It is REALLY working for Elements.cloud . Our offer is free, for ever, for everyone. But we started from a clean sheet. So we didn't need to disrupt ourselves, only the process mapping market. We need to start thinking way beyond (organizational) borders. Currently approaches (indeed still) used by the vendors and integrators are lagging more and more if you look at whole new ways of looking at the definition of work. This goes as well for compliancy industry. Transitioning to an understanding that the real benefits come from managing operational initiatives (increasing effectiveness and efficiency) and that in respect of the management of work/workload, besides BPM, although core to this, there are other "must-have" capabilities including R.A.L.B. (resource allocation,leveling and balancing) and FOMM (Figure of Merit Matrices) and data interoperability. Absent R.A.L.B. or equivalent, workers have no way to micro-schedule work across Cases they may be working on, supervisors have no way to level and balance workload. Absent F.O.M.M. or equivalent, Case Managers have no formalized way to non-subjectively periodically access progress toward meeting Case Goals/Objectives. Absent Generic Data Exchange (multiple publishers, multiple subscribers, each reading and writing data using their native data element naming conventions and having access to a library of formatters/parsers and encrypt/decrypt algorithms), any BPMs (or Case run-time environment) soon becomes a dysfunctional "island". I rarely see references to R.A.L.B. or F.O.M.M.and wonder how vendors selling BPM are able to help their customers increase operational effectiveness and efficiency. In addition to the above commenters, I hope Locker room process improvement initiatives will be disrupted. Like spending 6 months turning has-been process models into might-be done models. Don't get me wrong. I like improvement. But I think it should be as close to execution as possible. And we all know that can be supported with technology these days. Everything can be measured. The status of every case can be known. Process Performance is known real time (for example with process mining). But improvement is not only technology, also culture and behavior. A culture of responsibility and reward on the shop floor, not afraid to fail, but most of all; open minds. Yes, because technology can be a big help to support the execution, management and improvement of your processes. As long as your processes solve the problems of your customers. But will your processes be valuable for ever? A turn side of technology is that it can offer other players the possibility to solve the same problem in another way. Things like Uber. They solve the same problem (getting from A to B), but Who? and How? was transformed. No process improvement project at a traditional taxi company could have prevented that. So, one side keep doing useful things better and on the other side; be open minded for problems in the world and see if you can add value to solve them. So, seeing improvement or innovation as a project. I think that will or should be disrupted. 1. "improvement .. should be as close to execution as possible" - many interpretations possible a) no point improving if you don't roll out the improvement to the execution environment, b) if you do roll out do this as soon as possible after remapping, model and if results look promising, move forward with implementation. 2. "Every executed case can be the trigger for an improved process" For sure, with data mining and statistical overlays (i.e. 80% of the time they skipped step 107 and inserted an ad hoc step 'abc' gives a clear indication that 107 should be dropped and 'abc' should be embedded). 3. "Culture of responsibility and reward" - in today's job market, having a job is a strong incentive to being responsible and the job itself is somewhat of a reward, so, do we really need a UI that does more than make work easier via the UI than not via the UI? 4. Re technology being a big help and offering the possibility to solve the problem in another way. Lots of potential here no only for solving problems but identifying opportunities. Our people do a lot of strategic consulting and we find after several decades of looking to improve approaches that a multi-root hierarchical dbms with a graphic presentation and free-form search capability works very well. Newcomers find it amazing to see 10,000 documents on one screen with the ability to effect virtual links on demand. I hold the view there are significant opportunities for consultants to help their clients with strategy AND operations. We have for several years offered CiverMind for free to consultants. Clearly, it's not easy to get the attention of CEOs and if you do, not easy to keep their attention for say more than 5 minutes (at that stage they are either on board or you are out the door), but per diems rates for strategy coaches are pretty good. In the big picture it will be enterprise software lead by the digital movement which forces the focus on people internal and external with their processes where all information is created. It will be how this is delivered which will be the big disruptor. The recognition of build with no/low code which delivers Adaptive functionality will see dramatic reduction in cost including lock-in to the point that software will be sold as an asset to be owned by the business not just their data with control over change in their hands. It will have huge impact on SaaS ......no longer viable against such a change - hardly viable now? ERP slides into history books even if needed for the interim changes it will be used as an expensive accounting system. Its amazing (in healthcare) that Case Management goes back a few hundred years. Even more amazing was that it was and still is Adaptive. You want to decide what next to do to a patient, Open the manila folder and look at the Patient History. Easy enough? The problem with paper charts for healthcare professionals was 'Where was the chart?". And, what information might have been missing from the chart at the time the healthcare professional looked at the chart? So how did the '"very large suppliers" (and not-so-large suppliers) fail to crosswalk from their ivory towers to healthcare where there was a tried-and-true methodology for converting knowledge into information? There will be no disruption of the BPM market until it starts to effectively address small companies. In which process execution rules and everybody can be a process improver ? In the Western values world (let's call it that way), there is a sizeable market for citizen developers and people who roll their own cigars when it comes to delegated process improvement and decision-making. However, the majority of the world does not particularly share the same values, at least when it comes to doing business. So this world is far more interested in solving more "standard" process effectiveness/efficiency problems, just at a much lower price tag / time span and with a different propensity to customization. I am with Ian Gotts in this subject. I think that freemium BPM Suites will be disrupting how the discipline is seen and used by tenth of thousands for small and medium companies, but also by big companies tired of traditional enterprise software. I agree that this involves amazing User Experiences, strong financial support to burn money a long time until you become profitable and moreover and a very strong moral to keep on trying and trying. Excellent question. Everyone wants to know about disruption. Although even those in the know don't seem to be very good at predictions (given recent "governance events" in USA)! How about "no disruption, and BPM is still a game of inches"? I'm very much for citizen developers but I see BPM as challenging technically and from a business perspective. And BPM as a body of knowledge is very substantial -- probably comparable to accounting in its richness. Technology adoption and technology diffusion for major technologies just doesn't happen that fast. 2) BPM-as-Situational-App-Platform (a.k.a. "something about low-code"
Let me add to your thinking on those three big problems and how we solved. MDM is a must have to allow use of legacy data and systems. We initially built a server side message queue which allowed the process application to link into legacy as dictated by the process requirement. Later we added a tag library allowing the web form to automatically access legacy again driven by the needs of the process or orchestrated by the in built process engine. Here is where IT support needed to access legacy but always the slave to the business process and people needs. Process governance I see as the the overriding discipline on build running and change support for the required applications. Our design was always driven by must be simple and readily understood just how by business people. This has allowed the closure of the gap between people and the silo processing systems and as such puts governance fair and square into hands of business. We recommend a leader with business analyst skills to take on this responsibility but also encourage users to think of better ways to work in knowledge change is readily supported but of course is always seen in context of the end to end process which the leader can coordinate. You can allow user to change were change is anticipated but experience shows its not really their job! The BPM engine should have no constraints we achieved this by recognising business logic never changes and in reality very few "task" types. Combined with powerful flexible links we discovered it was able to build any business process and effectively removed need to code. Sure complex algorithms or calculations might need technology support but of course all reusable. The most important task type is the UI which is embedded into the Platform and other requirements such as rules state time escalation pending etc all ensure validation of the required process which is built in the "model" for both ease of build and transparency. It uses a declarative technique to translated from model into the data centric process engine that automatically sets up the process ready to run...at a click of a button. We were decades ahead of our time but the technology is secure and preparing for "our year"... and sharing globally being very suited for smaller businesses as suppliers with domain knowledge and at cost which opens the door for use by SMEs...... and disrupts the big boys......well that's the vision...? Wonderful programme story David -- and especially the details on how you finessed the three challenges. I note your comment that "We were decades ahead of our time". This highlights the role of leadership, especially where you can bridge both business and technology without short-changing either. Bravo. What I get out of this is . . .
a) Agree MDM is must have. b) Agree process governance needs to be the overriding discipline (I would re-phrase it to Case governance, but, never mind) . c) Agree "The BPM engine should have no constraints" meaning, ability to handle any mix of structured and unstructured work. For sure, it needs to be a "data centric process engine"
It's not too late for others to have "their year" by figuring out the puzzle the way you did. There are a lot of opportunities for disruption. Becoming between enterprises and business parties (Thanks to Walter and blockchain). Becoming vertical like Pega in CRM and Appway in on-boarding. For example, by doing many BPM on-boarding projects, Appway became an expert in this domain. Becoming affordable for small clients (Thanks to Bogdan). Becoming financially correct by pay-as-you-go schemas and cloud-based deployment. Becoming versatile regarding supporting coordination techniques (Thanks to Karl). Becoming super-agile for classic functional applications. Becoming first choice for behavioral applications (is it like John’s situational-app?). Becoming security enabler for IoT. Outstanding list of opportunities! I'm pessimistic however that any of these opportunities will gain so much momentum "over the coming year" so as to be called "disruptive". As a sales person I've learned not to have "happy ears", so one looks for the "no". For the longer term though, absolutely! Goals worth pursuing! Thanks John. Hope that some external forces and events can speed up this process of becoming "ripe for disruption". Expanding on Patrick's notion, above: selling BPM as an enterprise software suite, like ERP or CRM, makes less sense every day (except in the context of a direct replacement for those packaged applications). BPM's destiny isn't to replace your packaged apps, though that will continue to happen with great frequency; rather, BPM will become the configurable, low-code platform on which digital business is conducted. It will (and in many ways already has already begun to) revolutionize the way businesses conceive, create, operate, and improve digital products and services. And, on that happy day, great programmers around the world will be freed from working in industries in which their very existence is mere overhead, and will found or flock to software companies. Thus will be born the virtuous cycle that will drive the next leap in software technology. (1) REVOLUTION -- Is there a contradiction inherent in the slogan, loosely updated from your note: "Programmers, you have nothing to lose but your code". Maybe programmers won't be so happy about losing the bottleneck from which they collect rent? And how many programmers are really good business analysts, anyway? (2) SEMANTICS -- As for "low-code platform", consider that after a while "code" is not a focus of attention, sort of like how punctuation in writing is important but uninteresting. The focus will now be on what was supposed to be the focus all along, "business semantics", i.e. "business semantics for automation technology". I'm reminded of advertisements a LONG time ago, for "programmer/analysts". The job description was something like 95% programming and 5% analysis. And of course the 5% was the valuable part. How about BPM becomes the "backbone of business semantics technology"...? I agree with Scott here: BPM is already becoming a low code platform to build companies key business applications. I also think that we will some major evolution in the way BPM platform assist users for more efficiency. Leveraging data collected by the BPM platform using artificial intelligence capabilities will be a great opportunity to turn BPM platform into true business personal assistant. HI, Antoine . . .
We have already seen a "major evolution" in the way BPM platforms assist users. It involved little more than a embedding BPM within a Case run-time work/workload management environment. The "new" (not really) BPM is core to Case run-time environments and provides background orchestration and some governance to users. This takes us to about 80% of the distance toward a "true business person assistance" based on our current understanding of the potential contribution, the rest coming from AI. The only problem with predictions like this is they are usually wrong by a couple of orders of magnitude - AI as we have understood it, as we understand it today, probably is a small part of what AI can contribute in the area of personal and corporate assistance. The problem right now is with onboarding of functional unit staff to "think" process and have access to tools that do not require much BI and IT hand-holding. Given proper tools, the residual and non-trival problem is onboarding of the staff - they can recite a long list of excuses that start with too busy, not their job [it is their job]. How can we motivate them? By all means look to AI, but, meanwhile, let's go after the 80% low hanging fruit. 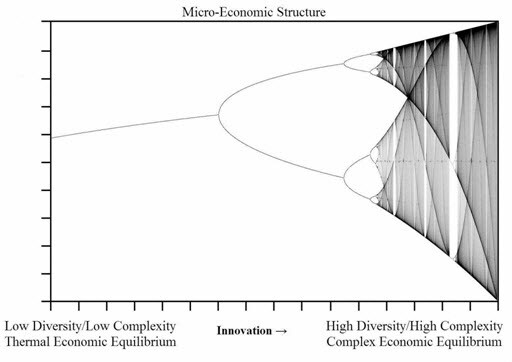 I found useful the paper Chaos Economics to illustrate these points.